In Android Security, we’re constantly working to better understand how to make Android devices operate more smoothly and securely. One security solution included on all devices with Google Play is Verify apps. Verify apps checks if there are Potentially Harmful Apps (PHAs) on your device. If a PHA is found, Verify apps warns the user and enables them to uninstall the app. But, sometimes devices stop checking up with Verify apps. This may happen for a non-security related reason, like buying a new phone, or, it could mean something more concerning is going on. When a device stops checking up with Verify apps, it is considered Dead or Insecure (DOI). An app with a high enough percentage of DOI devices downloading it, is considered a DOI app. We use the DOI metric, along with the other security systems to help determine if an app is a PHA to protect Android users. Additionally, when we discover vulnerabilities, we patch Android devices with our security update system. This blog post explores the Android Security team’s research to identify the security-related reasons that devices stop working and prevent it from happening in the future. With these factors in mind, we then focus on ‘retention’. 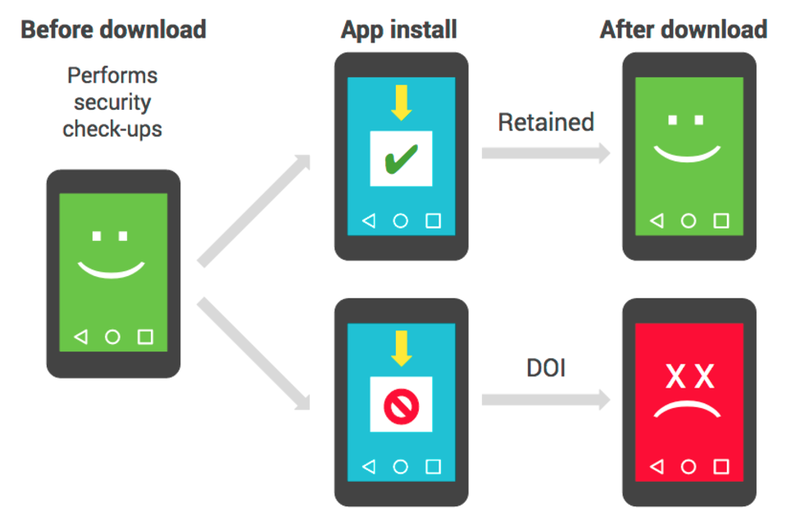 A device is considered retained if it continues to perform periodic Verify apps security check ups after an app download. If it doesn’t, it’s considered potentially dead or insecure (DOI). An app’s retention rate is the percentage of all retained devices that downloaded the app in one day. Because retention is a strong indicator of device health, we work to maximize the ecosystem’s retention rate. Therefore, we use an app DOI scorer, which assumes that all apps should have a similar device retention rate. If an app’s retention rate is a couple of standard deviations lower than average, the DOI scorer flags it. A common way to calculate the number of standard deviations from the average is called a Z-score. The equation for the Z-score is below. In this context, we call the Z-score of an app’s retention rate a DOI score. The DOI score indicates an app has a statistically significant lower retention rate if the Z-score is much less than -3.7. This means that if the null hypothesis is true, there is much less than a 0.01% chance the magnitude of the Z-score being as high. In this case, the null hypothesis means the app accidentally correlated with lower retention rate independent of what the app does. The DOI scorer and all of Android’s anti-malware work is one of multiple layers protecting users and developers on Android. For an overview of Android’s security and transparency efforts, check out our page.